In October of 1965, Helen Schucman thought she was going crazy. It didn’t make sense to her that she was sitting up nights with a steno pad taking notes from an internal voice. In fact, she found it pretty upsetting. Here she was, a Ph.D. in clinical psychology, a tenured Associate Professor at Columbia University Medical Center and she was hearing inner dictation? That wasn’t the least of it. She was Jewish by descent and atheist by decision and the voice, when queried, told her that she could call him “Jesus.” All this did not sit well with the 56-year-old researcher. Plus, it was costing her sleep. Her boss, Dr. William “Bill” Thetford, noticed Helen’s apparent preoccupations after a few weeks. When prodded, she told her colleague about the nightly scribing. He asked to see the manuscripts. Thetford was mightily impressed with what he read. There was a clarity and consistency of content that convinced him that something important was happening. Over the next seven years, Helen and Bill compiled the product of her nightly mission. Daily, she would dictate from her handwritten notes and he would dutifully transcribe into typewritten text. That manuscript, that urtext, became what the world would know as A Course in Miracles. The result of Helen Schucman’s experience was a three-volume set of hardcover books titled A Course in Miracles (ACIM), a spiritually-based, psychologically-oriented, self-study course intended to gently guide the student toward a shift in perception and the experience of inner peace. Neither Helen nor Bill claimed authorship and it was generally acknowledged by them that the content was directly channeled to Helen from the source who called himself Jesus. A United States copyright was granted to the Foundation for Inner Peace, which published the set in 1975. But that copyrighted version wasn’t the first copy of ACIM to see print. Copies of ACIM had been previously disseminated and in April of 2004, that caused a federal court to void the 1975 copyright, putting ACIM into public domain. Jesus got his copyright back. How the court came to see the evidence is part of our story. How the Course Came to Be. After nearly seven years of laborious transcription, Helen and Bill had a finished manuscript that up till then had been seen by only a few acquaintances. In 1973, copies of that manuscript were given to more people, including Hugh Lynn Cayce, the son of the late psychic, Edgar Cayce. Others who received copies included a co-worker and fellow psychologist named Kenneth Wapnick, a Catholic priest and another friend. All of them were similarly impressed with the work. In 1975 A Course in Miracles (ACIM) was published in three hardcover volumes: a 622 page Text, a 478-page Workbook for Students and an 88-page Manual for Teachers. The Course became known as a self-study curriculum that could help the student shift or change his or her perception of the world. It taught that cause was within rather than without and that a connection with the energy of the universe (love) would manifest miracle-mindedness. ACIM flourished and propagated around the world. By 1999 there were about 1.5 million copies in print and thousands of study groups. In the early years, the Foundation for Inner Peace, the original copyright holders, had a very laissez-faire attitude toward reprinting or citing passages from the Course. That suited students and groups using it in their materials. 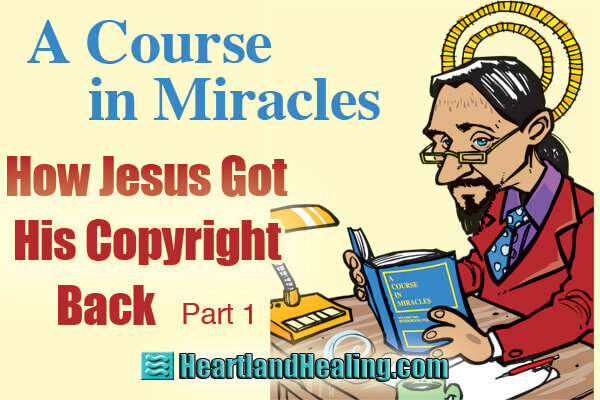 In 1999, nearly 25 years after initial publication, the copyright changed hands and became owned by Kenneth Wapnick and his Foundation for A Course in Miracles (FACIM). Things changed. What followed was a serpentine story of revelation and fortune that freed the Course and allowed students to once again use the Course without hindrance. That story begins in Omaha.